LOT Polish Airlines is considering introducing flights from its future base in Budapest to Belgrade. According to the "BUD Flyer" portal, citing industry sources, the airline is looking to commence services between the two capitals to better feed its network of long haul routes. The Warsaw-based carrier is creating its first airport hub outside of Poland in response to recent growth and route expansion opportunities. 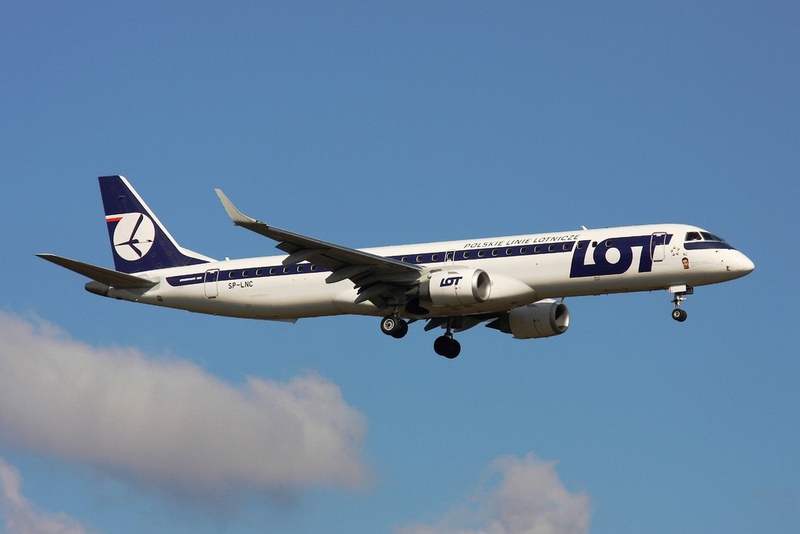 The aim is to position LOT as the new transfer airline of Eastern Europe. The carrier already operates to several destinations from Budapest, including New York, Chicago, Krakow, London City and Warsaw. It will introduce services to Brussels and Bucharest in September, as well as station an Embraer E195 jet in the Hungarian capital. The national carrier of Belarus, Belavia, currently operates two weekly services from Budapest to Belgrade. Air Serbia launched daily operations to the Hungarian capital in March 2014 but suspended the service in October the following year due to poor demand. The Serbian government has earmarked funds to subsidies flights between Niš and Budapest from July 2019 until 2023. The route will be maintained twice per week. An operating carrier is expected to be selected on May 6. In 2017, Wizz Air, with the support of the Hungarian government, launched services from Budapest to Pristina, Skopje, Podgorica, Sarajevo and Tirana, which have so far proved successful. This would actually be a smart way to get some transfer passengers to the US and Canada. Yes then they can reduce the Warsaw flights. Problem is that they can't add more flights from WAW because the airport is full. haha, you mean Belgrade airport? There are more gates at WAW, at least not until the expansion is complete which won't be for another two years. Why do you think they are adding 12th flight to BEG in September and not in June? BUD is also 110% over capacity. Could be but BUD struggles with yields which is why they might be after LO which is willing to pay more to use airport's facilities than FR or W6 do. It will better connect BUD and BEG and from the other side it will increase connectivity for passengers from Belgrade. Wonderful, another route that JU surrendered without a fight. No instead of getting feed from BUD for JU500 LO will be getting (even more) feed from BEG for their flights to North America. Makes sense that LO is after connecting passengers out of BUD since their long-haul flights are not performing well. I think Chicago was around 50%. I wonder if they will also offer connections to London City and Brussels from Belgrade via Budapest. 2015 was 4 years ago and there is no point looking back now. If JU already gave up flying to BUD then at least this news should be seen as very positive for Belgrade passengers. ju ended the route because they could not make money on it and had other ways to employ their ATR which they don't have enough of as is. JU should have first strengthened its regional network to feed its transatlantic network. It would have helped JFK flights to become profitable and probably allow it to launch more flights to north America. ORD, YUL, YYZ. Now LO is doing it from BUD. Since JU is dragging its feet with starting Toronto, others will come to take away the cake and probably by dumping fares. My thoughts exacly. LO doesn't fly to YYZ from BUD - yet! Those flights from WAW to YYZ are mostly empty from Nov to Apr . I travel Z fare and most days there is over 100 seats empty . Even summer time there is always open seats to and from YYZ . LO reduced winter schedule to YYZ 2 years in a row and still not able to fill up seats . AS to JFK is always running almost 98% load factor fron may to Oct , no need for a few transfer passenger from BUD . Silly comment . In 18 months people are going to take 3 hrs high speed train instead of flying anyway . JU pulled out of BUD as there were no 100 people daily able and ready to pay 130 eur for a return trip. I have no idea how anybody think they will be able to fill in thousands of seats in the high speed train at the prices normally paid for such a service in rest of Europe. This high speed train will not survive on BEG-BUD traffic but rather on the one from Belgrade to Novi Sad/Vrbas/Subotica... and then the same on the domestic Hungarian market. Nice, although Belavia is a good option as well to Budapest. Da. Ako ne moraš letit na određen dan. 2 weekly flight with a 20 year old CR2 50 seater...meh. I have nothing against CR2, but it would be better at least to have 4 wekkly flights. There is a good trip report on here of Belavia's Belgrade-Budapest flight. Actually BUD-BEG isn't operated only wit the CRJ200 but with a mix of everything, even the B735 was sent a few times. Hmm wondering why they are not sending their new Embraers´ to BEG. They are barely 5 years old. Their CR2 and 737s are quite ancient. They send their Embraers too. I saw one 2 weeks ago at BEG when I was travelling. And it was in their nice new livery. How come Belavia can operate CR2 and B735 as they wish, yet Turkish cannot replace A321 with A330 for one single day? Because they have different bilateral agreements. 90% of their March flights were operated by the E75. It would be a great option for London too with much more affordable prices I assume. I don't see the point for INI-BUD. Then again I don't see much point in two airlines flying between BEG and BUD either. Belavia seems to disagree with you. They said in a statement that they do carry local traffic. Guarantee the BUD-INI route is designed for Wizz Air. Guarantee the BUD-INI route is designed for LO. It makes much more sense to connect INI and not BEG. Agree. Why should Hungarian Government sponsor BUD-INI if Serbian can do it? It can't be designed for LOT because the condition of the tender is that you have to have one plane based in Nis, second aircraft based somewhere in Serbia and that the plane operating the route has to have over 120 seats. LOT does not tick any of the boxes. The only two airlines that do are Air Serbia and Wizz. LO ticks the box of having a plane with more than 125 seats. It does not because it will have an E195 based in Budapest. Look carefully at the map and you will realise that the airline is indeed LO and not W6. Flying an A320 on INI-TIV and INI-LJU is way too much. Logical to deploy a smaller jet. My guess is 2 LO aircraft based in INI: E170 and E190. What's so funny? Do you see an Airbus 320 operating between INI and TIV and v/v? The tender rule states it has to be a plane with 120+ capacity. I didn't make up the rules. So an E190 and E170 can't be used. I will let you know that Wizz operates Budapest-Skopje with an A321. Loads are great. LO has Boeings in their fleet so if they wanted to they could operate BUD-INI as part of WAW-BUD-INI. Great news if they connect LCY! I don't see LCY as an option. LO began linking LCY with EU capitals because it's much easier. Currently they are: BUD, VNO and WAW. Possible future routes might be: OTP, RIX, SOF, TLL and why not ZAG or LJU too? I think he meant to offer BEG-BUD-LCY as connections. This would be a good way to avoid Air Serbia's and Wizz Air's high prices to London. Plus people would get the chance to fly into City Airport which is most convenient. Go forward LO and no need to be gentle towards JU as long as their sales and management teams are in deep state of hibernation, fantasizing on becoming a leader! They are launching 9 new routes in summer, so I wouldn't say they are hibernating. Healthy comeptition is always good for the passengers. That stil does not mean they are hibernating. Let's wait and see. Well, that's one of JU's many problems. While they are waiting to see what's going to happen, others are taking actions. LO has hit the right spot this time and found the market they are targeting to. As long as JU has taxpayers' money to support their fantasizing they will hardly become a serious player on any market. With the launch of the 9 new routes, JU will become an even more serious regional player. LO is weak in KRR, RJK and MAD for example. What will be the frequency of the Budapest-Bucharest service? 12 weekly. Daily early morning and daily afternoon excl. weekends. Very clever. They also have 3 daily OTP-WAW which brings the total to 5 daily flights. Alert for Luftie, W6 and RO. Thanks. I'm really surprised. That's a very strong start for a new route. Does TAROM fly to BUD? Yes, 12 weekly as well. But W6 dropped this route a couple of years ago. 24 weekly (LO+RO) OTP-BUD is a lot on my opinion. Again, way many seats will be offered. Yes, RO operates 12 weekly flights between BUD and OTP, similar schedule like the one they have to BEG. Interestingly, all but one are supposed to be operated with a jet aircraft. Ovo mi je palo u moje slatke okice: with the support of the Hungarian government, launched services from Budapest to Pristina, Skopje, Podgorica, Sarajevo and Tirana. Zašto magyarska vlada sponzorira novcem poreznih obveznikova letove privatne aviokompanije, prije svega prema zemljama koje za veći dio domaćeg stanovništva nemajo baš nikavu vrijednost? Because the Hungarian government wants to push their influence into the Balkans and without non-stop flights that difficult to do. Wizz Air needs regional subsidies since they were massacred on BUD-OTP and I think they even suspended or reduced BUD-Cluj. Yes, both routes from BUD to OTP and CLJ were suspended. If I am not mistaken, BUD-CLJ was launched when TGM was closed for repairs. There is a 2 weekly BUD-TGM service. After all, this is the city and region with the highest number of ethnic Hungarians in Romania. Historically, Transylvania belonged to Hungary. If you ever go, you will realise it has got nothing to do with the rest of Romania. Landscape, architecture, etc. Znaci ulaze u rat sa AS za JFK putnike. S obzirom da su im cene poprilicno jake,ne verujem da ce osetno uticati na AS. Ako AS pokrene liniju za Toronto na jesen to ce itekako uticati na Lotovu liniju za Vasrsavu. How long do flights between Belgrade and Budapest take? Around 40 minutes give or take. Sorry did not see reply above mine. Well beats taking the train anytime. Or driving for that matter, especially in summer. I remember years ago MA's Q400 made it in just 17 minutes. I think there were some crazy winds. It's very interesting how LO decided to restore the MA model and expand agressively in Eastern Europe. This is not going to be in the likes of W6. The best thing is the current fleet they have that nicely fits in their expansion. The Embraer jets are efficient, cheap to operate and easier to be filled. That said, it seems they are resuming even old schedules from 1981! The biggest difference will be that those flights will mostly be transfers and not O&D similar to W6. I don't think this model will work out for them in the long run and I think they will precisely end up like MA. They were saved from the brink of collapse just a few years ago. Pethaps Air Serbia will return to Budapest but from Nis. This would be nice. Hope it happens. This route didn't really cross my mind it makes perfect sense for LOT and their ambitions at Budapest. lets wait and see how long their endeavour in BUD lasts. I'm also not convinced LOT's model will work. Bad news for Air Serbia. I used to fly Budapest > BEG regularly when I lived in Hungary. The reason it go so much local traffic was that the other connections between the cities are so poor - the train is more than 7 hours and frequently delayed; and if you're a spoilt West European like me you don't like sitting on busses (I just, but the bus also took quite some time). Driving is ok, but in summer the border queues to get back into Schengen can sometimes take more than an hour. So that's why the plane was ideal, it was actually quicker. From what I understood at the time, it wasn't so much that JU had bad loads but it just wasn't the sort of traffic they wanted - it was either full of people on one route to/from Cyprus, or people like me just using P2P. It'll be a good move for LOT. They will get some decent transfer traffic and direct, I'd think. What I do wonder is that when this train line is eventually upgraded, I know the work has started on the Serbian side, it may suddenly be a lot less profitable. Hmm, any chance of future subsidized INI-BUD flight to go with stop in BEG? People would easily chose car instead of a plane for any P2P flight. I remember colleague of mine taking the JU flight to BUD - it was a disaster from a logistical perspective (time from the city to BEG and again from BUD to the city, some delay etc.). Again, the main competitor for LOT and Atlantic services from BUD would be Lufthansa group - so, very brave if they try. Believe me, road trip to Budapest in last 2 years is very easy turning to be nightmare also, mainly because of border. Additionally, if you go by your car you might also need to drive it through city center (one or another), you need to park it (many hotels in Budapest don't have free parking), etc. And of course, not everybody are willing to drive for 5-6 hours, if you are flying you can do whatever you want during flight. It's a same distance as Zagreb for example, and people do go there by airplane. I think Austrian Airlines is the most affected by this since BUD and VIE share the same catchment area and now LO seems to be going after OS' key transfer market. LOT will also launch Budapest-Seoul soon. Air Serbia has no one else to blame for this. They launched long haul with only one destination and failed to follow up in three years. They should have committed to several long haul destinations within the first 12 months of commencing JFK operations or not start long haul at all. They said long time ago that after opening JFK they will wait for few years to make that route profitable in order to open new one. As there are rumours JU will open Belgrade-Shanghai and Belgrade-Toronto it seems they are following their plan. Who of the four made the call to stick with only JFK for a while: Vucic, Mali, Hogan or Kondic? The only hope for JU is the bankruptcy of 9W. Abu Dhabi can then transfer an additional 330 or 2 of them to ASL. A quick launch of flights from BEG to YYZ would permanently prevent LO. What side of the 51/49% ownership decided to launch with only JFK? In 2016, the now former President and CEO of the Etihad Aviation Group, James Hogan, said the Serbian carrier could expand its footprint in North America in two to three years. "We have already considered flights to Chicago and Toronto and these services could be introduced in two to three years. First off, the New York route must become functional. We don't want to make a decision that would set Air Serbia back", Mr Hogan noted at the time. Long haul landscape at ZAG, OTP, BUD, WAW and BEG was completely different back in 2015 when JFK route was launched. Those airports significantly grew long haul services while JU was stuck with only one. Hogan's slow growth strategy did not match market dynamics of the wider region. Global economy isn't looking that healthy right now, once situation goes south those you mentioned will be the first to go away. Let's face it, LOT can affect Air Serbia on JFK route only if they offer good prices. I mean, who would choose LOT with a connecting flight in Budapest (I assume you would have at least 3-4h layover) over direct flight for NYC for the same or even a bit lower fare? "Of those transferring through Warsaw, the majority of passengers connect onto flights to Toronto and several points in Western Europe"
In regards to Toronto, they tend to have competitive prices from time to time. It varies as sometimes they can be more expensive than LH, but other times they are the cheapest option. The best part is that if you fly from YYZ to BEG you are allowed to bring 2 pieces of checked baggage in economy and 3 in business. I also read before that most people from YYZ now use LO in addition to LH group. Does anyone know how true that is? By the way TK is always super expensive if you fly from YYZ to BEG for some reason unless its in February or something like that.